Hardwood floors offer rugged versatility in the dry freight industry. A sanded and sealed surface resists moisture and wear and tear from regular use. A wooden floor means any repairs will be cheap and painless simply replacing damaged boards and re-coating them with linseed oil to seal the surface. At Drake's the underside of hardwood floors is covered with sealed sheets of Meranti board to keep the elements from rotting the floor itself any sooner. 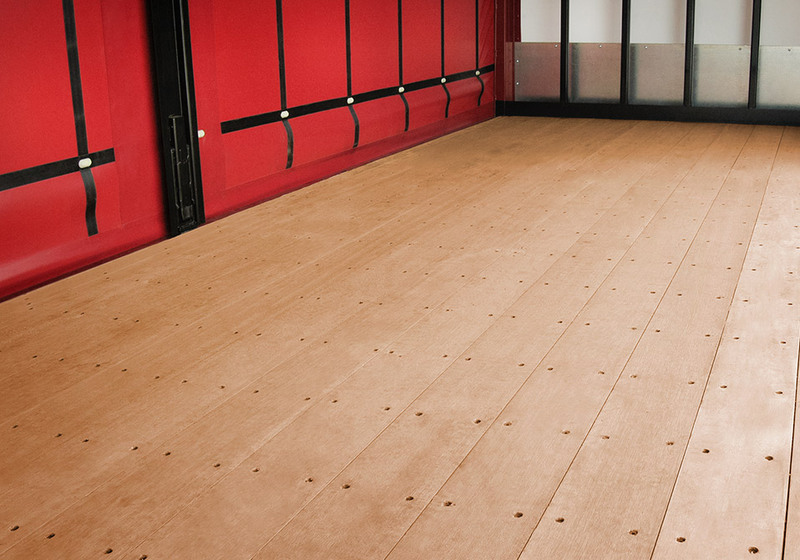 Combined with our undercoating, these floors have an excellent lifespan in the moving and dry transport industries. Drake's aluminum reefer floors are comprised of full, box-length, floorboards that interlock at the edges. The "Inverted-T" board style allows water to run freely in grooves while notched ridges keep friction in the floor for safe working conditions. These floors can be seamlessly welded to aluminum kick plates that can run up the walls to any height you may desire. The floor seams are caulked using heat resistant adhesives to keep the temperature down. Drain holes can be installed throughout the box to keep loads dry as well as cold. If the aluminum floorboards aren't your speed we happily offer form fitting checker flooring in Aluminum, Steel, or Stainless Steel. These sheets are welded together at all seams. Screws used to secure the flooring sheets are welded over as well to totally seal the unit from outside elements. These sheets can have an angle bent into them so the run directly up the wall as a one piece scuff board and floor. These floors can be coated with epoxy or paints to secure the surface even further.